Adams Heating and Cooling can help you with all of your air conditioning needs in the greater Kalamazoo area. From new air conditioner installation, to air conditioner repair, to air conditioner maintenance with a spring season tune-up, Adams service and quality are second to none. They have the answers to your air conditioning questions! Why would you want an air conditioner? For most people, it comes down to having a comfortable environment for your home. During the summers in the Kalamazoo area, not only does an air conditioner cool your home to your desired temperature, it provides additional comfort by dehumidifying your home. Who in particular benefits from an air conditioner? The fact that an air conditioner dehumidifies your home makes them particularly helpful for people with allergies, breathing problems, and/or health issues. Considering how bad allergens can be in the Kalamazoo MI area, an air conditioner can be a handy thing. If you have allergies or asthma, you may want to also consider an Air Purification/Filtration system. Air Conditioners absorb the heat in your house through refrigerants, and dissipate that heat outside the house. The creation of the air conditioner has had major impacts on our history; in fact, the introduction of residential air conditioning in the 1920s helped start the great migration to the Sunbelt. When do I need to upgrade my air conditioner? An upgrade is especially recommended for air conditioners that are more than 10 years old that do not use new, improved coolant. New air conditioners will provide better energy efficiency, while also being more ozone friendly. What type of air conditioner maintenance is recommended? The best maintenance routine is to schedule an Air Conditioner Tune Up. When Adams completes a tune up for a customer, it includes washing and cleaning coils, checking for any problems, and performing other general maintenance and cleaning. Adams sells several models from the Amana brand of air conditioners, and they recommend different models depending on your situation. All models are energy efficient, but only a few qualify for rebates. 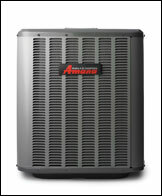 A big advantage of the Amana brand is their warranty, widely considered one of the best in the business. Whether you already have an air conditioner, or you are purchasing a new one, there are a few other items you may want to consider. The first item is an Air Purification/Filtration system. These work in conjunction with air conditioners to provide a better and more comfortable environment. Another possible option is Zoning to help improve the efficiency of your air conditioning.